Arrow Sudoku or Sudoku Arrow is a variant of Sudoku. 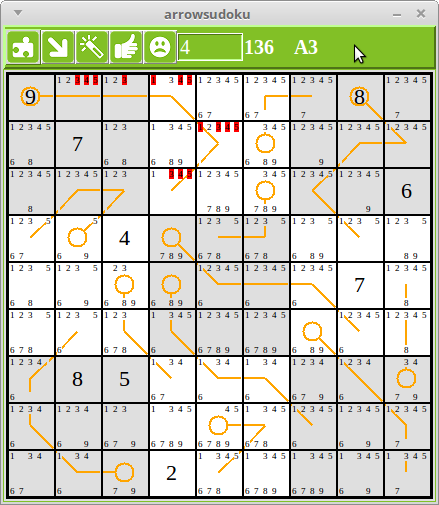 The grid and the rules are the same but arrow sudoku includes an extra contraint by requiring the answers for some chains of cells (the summands) to sum to the answer of another (the sum). On the grid sum squares are shown by a circle from which a line radiates to pass through the centres of the summand squares. Please refer to the adjacent figure. All of the standard sudoku algorithms still apply but the addition of this arithmetic requirement necessitates new types of reasoning and we have devised three extra hint algorithms which use the chained cells to help solve the puzzles. Apart from these the game is pretty much the same as our sudoku game and so this descripition is quite brief and players are requested to refer to the sudoku page for more information. That being said, a few more remarks are in order. The game contains 1000 puzzles, each of which can be solved by the built-in hint algorithms. Obviously the arithmetic constraint provides a great deal of extra information and consequently means that arrowsudoku puzzles need far fewer clues than those of standard sudoku (which require at least 17 clues ( Gary McGuire, Bastian Tugemann, Gilles Civario)). Some puzzles may have as little as one starting clue! 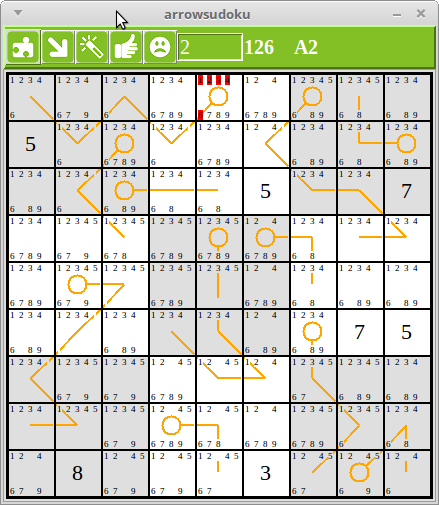 Given the complexity of defining arrowsudoku puzzles we do not provide methods for loading additional puzzles. An option to change the colour of the "arrow" has been added to the Colour setting methods. 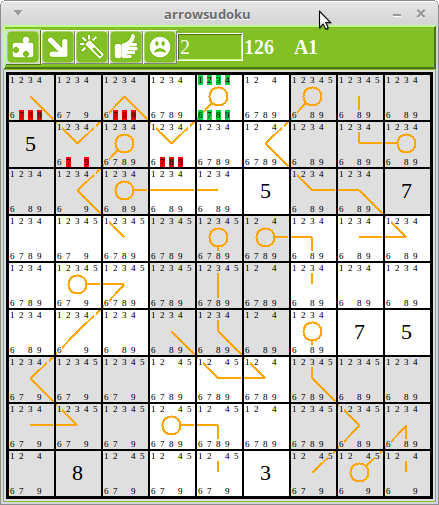 Players will notice that the lines defining the chains of summands tend to become fragmented as candidates get removed as the game progresses. The fragmentation is never so bad that the chains cannot be followed but, though it is unsatisfactory, we have been unable to find a simple solution. Apologies. Most of the algorithms used by arrowsudoku are the standard sudoku algorithms, but below we outline the additional ones we have devised to take advantage of the arithmetic constraints. They are imaginatively named Arrow 1 (A1), Arrow 2 (A2) and Arrow 3 (A3). Candidates highlighted in green are the "reasons" that the candidates highlighted in red can be removed. Arrow 1: candidates on the path of the arrow are too large to contribute to maximum possible answer. Here the possible answers are 1,2,3,4,6,7,8,9 but even if the answer were 9, any summand greater than 6 would be too large. Arrow 2: candidates are too small to be answer, given the minimum candidates along the path of the arrow. Here the minimum sum from the arrow squares in the box in the top left is 1 + 2 + 3 = 6. Add 1 from the next box and the minimum sum is 7, so all lesser candidates can be deleted. Arrow 3: candidates are incompatible with the answer or potential answers. Here the answer is known to be 9. If we use 1 or 2 from the first two squares in the path, the smallest we can use in the next square is 3, and so must use 2 and 1 from the next two squares. All other candidates can be deleted.